What’s the story in the first part here? Eurostat (a non-policy organ of the European Commision) draft a letter explaining why IW is classified the way it is. They send that draft to the CSO who spot an error. This is run of the mill inter-agency operations. The error had no bearing on the decision. The error is fixed. The classification remains. People go on with their lives, other documents are drafted. The Sunday Times find out and report it as if its news. Wonderful insight there into the machinations of statstical offices. You know, in Eurostat, when they have a meeting a working level, the meeting organiser has to bring the bicusits him or herself. They serve the tea in plastic cups not big enough for a real cup of tea. 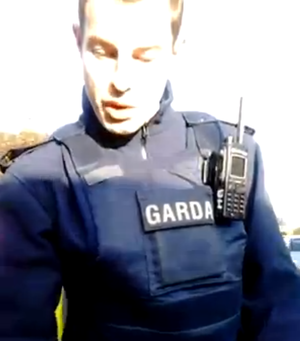 Why are the CSO getting so annoyed about it then? “Senior policy makers in Ireland believed Eurostat, the EU statistics office, became “increasingly politicised” in deciding if Irish Water was a non-commercial body controlled by the government. Padraig Dalton [head of the CSO] claims senior policy makers in Ireland [i.e. the Irish government] believed Eurostat, the EU statistics office, became “increasingly politicised” in deciding if Irish Water was a non-commercial body controlled by the government. Your reading comprehension isn’t great; it’s perfectly understandable as written. The point I made, which you haven’t refuted, still stands. They asked for it to be removed as it was inaccurate and inserted solely by Eurostat – as you can see if you read the letter in the image you provided rather than jumping to conclusions immediately. The CSO didn’t say it was ‘inaccurate’. This is something the CSO could, and should, have been very deliberate and unambiguous about if it truly were inaccurate, as you claim. They said that it ‘MAY be a misinterpretation…’, and that is on the basis that the Irish Government have not made any statements to the effect that privatization is ‘ultimately envisaged’. It is true that no public statements have been made in this regard. However, it is also true that policy decisions and directions are often discussed and agreed upon within Government, and with involved partners such as EuroStat, long-prior to public policy announcements or official statements – that’s generally how it works. So EuroStat making reference to their presumption that privatization is on the cards could very well just have been that – them them telling it like it is, as far as they understand it, in correspondence – to which the Irish Government suggested this MAY be misinterpreted as official policy, at a time that the policy is not yet official – as Government have not yet made any official statements to that effect. Yes, I am jumping also to conclusions here…just as you are that the EuroStat wording is ‘inaccurate’ when the CSO never claimed it to be. However, EuroStat are not newbies in this game, I’d think they’re unlikely to just throw that in there by accident or just make it up out of nowhere. This is a long and involved process where EuroStat are unlikely to be throwing guesswork regarding Government planning into their correspondence and hitting Send button to quickly. Knowing how PR is handled, this looks much more like the Government asking EuroStat to check themselves in what they say regarding privatization, so it not be misinterpreted as official, rather than a case of flat out telling EuroStat that they are flat out wrong and that privatization is not on the cards, no way, na-ha, not ever – where in God’s name did you get that idea? Yes a jump to a conclusion, but you don’t have to jump very far to achieve it. This is not something we would expect any public or official policy utterance on as it would be hugely commercially sensitive information. IW don’t even give out the number of real ‘customers’ that they have on the grounds that it is commercially sensitive and the Govt don’t speak of it either. So they are certainly not going to public discuss plans for privatization if they exist. Therefore, there being no public statements on this cannot be interpreted as meaning there categorically is not currently an ultimate plan for privatization. And yes, the opposite can also be said. So we are left to draw conclusions based on the preponderance of everything else we’ve seen so far…which to many of us suggests an original and continuing plan for ultimate privatization. The EuroStat letter adds more weight to this more than it detracts from it. 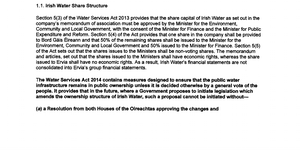 Water services act 2014 can be amended at any time by the Oireachtas, therefore any gurrantee around water services ownership is worthless. Went to see ‘no escape’ yesterday. the plot is there is a coup in a country after an American company privatizes water. The letter is correct. A plebiscite, a vote that asks the people of Ireland for their opinion, is all that stands between us and privatization. A plebiscite has been used once in the history of the state – about 77 years ago. It does not have the same rules for funding that referendums have i.e the government can spend tax payer’s money to tell us how great privatization is, even though the current trend in Europe is for remunicipalisation. Taking back the water supply from private companies saves the city of Paris €35 million a year. 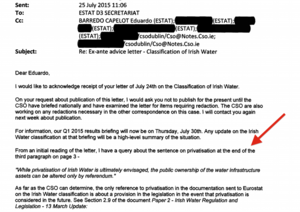 So, Eurostat looked at the structure of irish water, it’s systems etc and said that it was set up for privatization – something the country and his dog know is the Government’s/IMF’s endgame for Irish Water. The CSO then intervened and asked for the report to be changed. Is this the norm? does Eurostat take such direction from states stats. offices usually? And if they do, what else was changed from the report? What information was given to Eurostat about irish water? what access did Eurostat have? 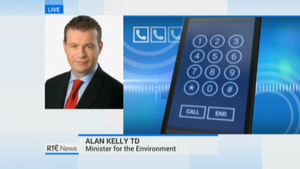 Alan Kelly came out straight off the bat and said it was wrong, with all we know about the cloak and dagger set up of irish water and of the awarding of metering contracts, what exactly is it that Alan Kelly knows. 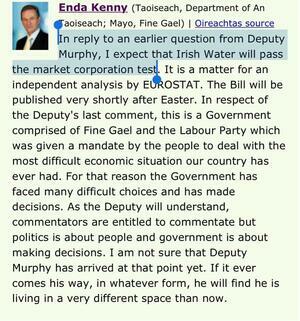 Regardless, it is obvious to a blind man that Irish Water was set up for privatization. The IMF has history, FG/Labour are following the neoliberal playbook and setting up political appointees in cushy jobs and handing out contracts to FG party backers. Yet people continue to denigrate and attack protesters who are bravely standing against this assault from the ground up. Irish Water will never get a cent from me. I will not reward the greed and avarice of the few at the expense of the people of this country. I don’t think this is a case of the CSO changing reports nefariously. I think it is simply to be expected that as-of-yet unannounced policy decisions (like the endgame for IW being privatization as you correctly say), should not be called out in classification document from Eurostat as being set in stone when Government have not made a statement to that effect. The CSO is not doing anything wrong here. They and Alan Kelly are simply still maintaining the line that IW is not planned to be privatized in the same way that any other pre-budget rumour etc they will say we “currently” have no plans for that. The key point here is, as you say, Eurostat have looked at IW in detail and are clearly of the opinion that the company was set up ultimately for privatization. They just shouldn’t be calling that out as part of the current classification of IW. The dogs in the street know it. Only the FG blind and right-wing ideologues will claim otherwise…while at the same time adjusting their argument to suggest that IW being privatized would be a good thing – whereby you wonder why they so vehemently deny privatization as the endgame goal given that they think it’s the correct one. Such is the mind of the irrational. Senior policy makers in Ireland believed Eurostat, the EU statistics office, became “increasingly politicised” in deciding if Irish Water was a non-commercial body controlled by the government. The claim was made by Padraig Dalton, the head of the Central Statistics Office (CSO) amid a breakdown in relations between his agency and Eurostat. Documents, obtained under the Freedom of Information Act, reveal the unhappiness felt by the Irish authorities over Eurostat’s decision that the cost of establishing Irish Water must be factored into the national debt. 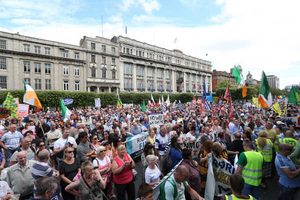 Irish Water has set out its proposed Capital Investment Plan (CIP) for the Interim …. The proposed capital expenditure described in this document can be …. A claim for €4.2 million for unexpected contaminated land ….. capital works, a response to the ECJ ruling and the impact of CSO and long ….. Loosening Political Control. opment of the economy and society in Ireland over the last. 50 years, from the founding of the CSO in 1949 to the dawn of the new …. leadership of the successive Directors: Dr Roy Geary. (1949-1957), Dr ….. piped water supply. However, nearly ….. Each revision has different underlying rules which effect the causes of. May 14, 2014 – them – lax political management, reckless lending and borrowing, … Ireland needs a strong and sustainable construction sector. …. According to the CSO, the number of households grew by 13% …… 16 Irish Water will submit a draft Connections Policy to the ….. document for upgrading Irish buildings. current proposal is the work of Irish Water which has taken over the task of promoting … INTERESTS – The scheme is promoted by vested political and commercial … This document and accompanying appendices will deal in greater detail with …. the CSO estimates for April 2013 and 2014 in Figure 1 show what actually . blood of the Irish economy, and cannot be neglected. SMs made … According to the Central Statistics Office (CSO), retail sales fell … No new water charges (the Government has not … despite claims that constitutionally compliant …. loan decisions, which can be up to 10 full weeks …. showing the political will to deal with it. glass palace at Mahon in Cork……are they…. ?